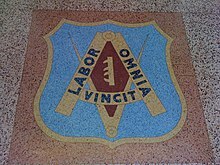 Labor omnia vincit inscribed on a floor tile showing the UBC Emblem. 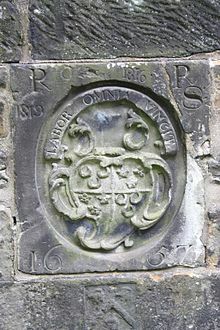 Labor omnia vincit is a Latin phrase meaning "Work conquers all". The phrase is adapted from Virgil's Georgics, Book I, line 145–6: ...Labor omnia vicit / improbus ("Steady work overcame all things"). The poem was written in support of Augustus Caesar's "Back to the land" policy, aimed at encouraging more Romans to become farmers.. The actual meaning of the phrase can be obtained as the following: "anything can be achieved if proper work is applied".